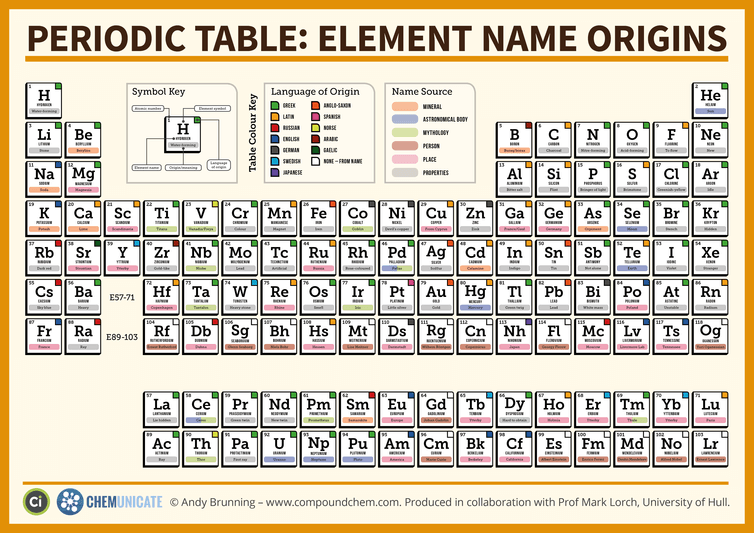 The Periodic Table of Elements’ Etymology. Four of the elements are named after planets (Earth – in the form of tellurium, Mercury, Neptune and Uranus). A further two are named after dwarf plants (Pluto and Ceres), while one after a star (helium from the Greek for the sun – Helios) and another after an asteroid (Pallas) feature on the periodic table. Thank you very much for this concise work. I concur with Bakka that a Wikipedia entry would be a great idea, probably separate from the main entry on the periodic table. The ‘fun’ facts here can really stimulate budding scientists. A couple of observations: In the paragraph starting with “Four of the elements” dwarf plants is a typo. In the following paragraph, there is a typo on Molybdenum. So periodic table is complete now yeah. is it fix now? I always wondered what the periodic table elements were named after! I had no idea the variety of the naming system that was used. I also think it is very cool that elements are still being added to the periodic table- it is crazy to think that there are probably many more out there that we haven’t discovered yet! Thank you for such an informative post!